The ancient floating city of Venice is home to many things; archaic and grand Italian buildings, gondolas and canals, and also, 5 reel online slot games. 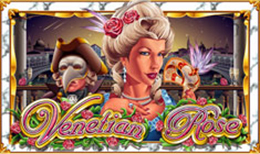 Venetian Rose is a wonderful Italian adventure 5 reel that features a beautiful Venetian damsel to help you along the way to winning some free spins, bonus wilds, and riches. Bellisimo! You can also see our homepage for more info. NextGen was established in 1999, just in time for the birth of the online casino changing the way we gambled forever. A reputable gaming developer, NextGen is known in the industry for providing entertaining and attractive games that are also profitable for its players. Keeping up to date, most of their online games are now mobile ready and have merged with social networks to keep things fresh and current. Travel back in time to Venice during the romantic period where you can enjoy masked balls, beautiful ladies in lavish gowns and splendid hair styles, and all the suitors were charming. Venetian Rose will take you there with this 5 reel, 25 payline slot game which you can enjoy on any platform from your laptop, tablet or mobile phone. Liven up your commute to work with this elegantly designed online slot game from NextGen. You can set your coin value at 1p up to £2 which means your spins can start from 1p up to £50 per spin. The beautiful Venetian Rose is looking for a charming suitor, will you help her by following the trail of playing card letters, numbers, opera glasses, fans and mysterious punt rides? Venice is renowned for its canals and bridges, all of which you can enjoy in the beautiful backdrop for this game. Keeping with the romantic theme, the lowest value symbols on the reels are the playing card letters and numbers. The four highest value symbols are the Pink Fan, the Pair of Eyeglasses, 5 or more of these will reward you with 250x your stake and 5 or more of the Gondola Ride and the Man In the Bird Mask symbols will give you a multiplier of 500x your stake. The Wild symbol is a beautiful lady, if you can get 5 of her you could be rewarded with an impressive 3,000x your stake! The main symbol you want to look out for is the Scatter symbol which is an ornate Red Mask. 3 or more of these Scatter symbols will trigger the main feature of the game which is the Free Spins feature. You will get 10 Free Spins plus all of your winnings will be multiplied x3. You can also trigger more Free Spins during the bonus game by collecting Scatter symbols during the feature. You also have a Gamble Feature, in this game you have the chance to double or even quadruple your winnings. You can play this feature after any winning spin. A deck of cards will take the place of the reels once you activate this risky game. If you want to double your prize you will need to choose the correct colour of the card, if you want to quadruple you will need to pick the correct suit. If you choose the incorrect colour or suit you will forfeit your bet so choose wisely. Experience the romanticism and the carnivalesque in this beautiful online slot game from NextGen. With some impressive multipliers and chances of big cash prizes you will never want this dream to end. Another game is waiting for you, Try your luck and play Wild Play Superbet.